Sheep farming is big business in Scotland. Maybe if you make enough of these fuzzy little critters, you can have your own sheep farm! This craft can stand alone as a doll, or be used as a business card / photo holder. 1.Draw two 2 x 3 inch oval shapes on a piece of cardboard and cut them out (you can download the template if you want to use a pattern). These pieces will be the sheep's body. Draw and cut out a smaller, second oval for its head. 2.Glue cotton balls all over ONE SIDE of one piece of the sheep's body and let the glue dry. 3.Cut the cotton swap in half, and glue one half to each side of the sheep's head to make ears. Then glue a cotton ball to the top of the sheep's head. Next, use a marker to draw a face on the sheep. 4.Glue the sheep's head to its body. 5.Glue two clothespins to the back of the body and let the glue dry. 6.Glue the second piece of cardboard over top of the two clothespins, and cover it with cotton balls. You now have your very own little sheep! 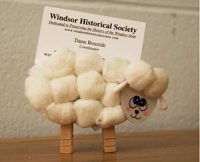 You can stick business cards, photographs, important messages, or anything else between the clothespins; or, you can let the sheep stand alone.